Easy access to ice climbing in Sandstone, Minnesota. 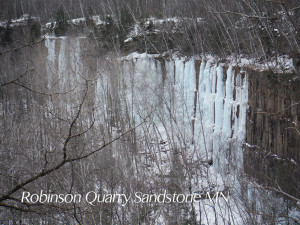 With farmed ice in Robinson Park ice climber’s are sure to get access to frozen walls all winter. 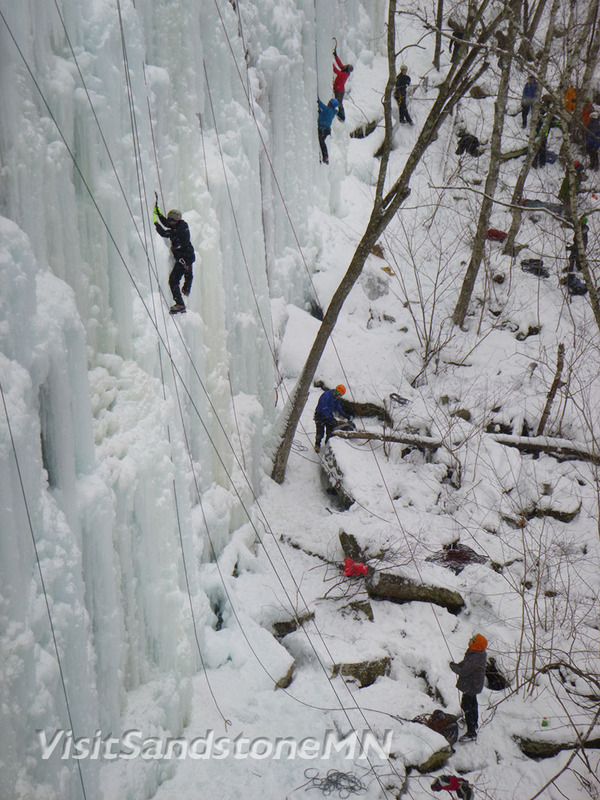 Located right in the town of Sandstone MN, the ice park draws climbers from across the country to try the sport of ice climbing. Lights have even been installed to keep the action going into the evening. 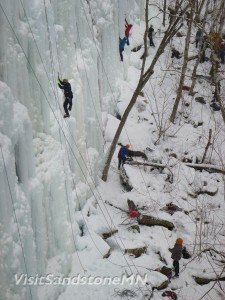 The Ice climbing season kicks off in early December when the walls get sold enough to hold the ice. The Sandstone Ice Festival , Sandstone, Minnesota’s celebration of winter, happens in the first week of January. The Ice Festival has a 12 year history of bringing climbers into the Park, and organizing instructional clinics. Robinson Park is open all year to climbing, no fees, just be respectful of others using the park. 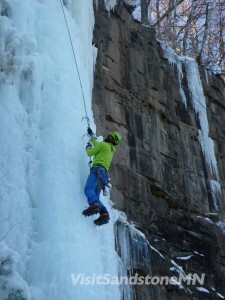 Visit Sandstone Minnesota for the Ice Climbing, plan your trip today. No need to invest thousands of $$$$ in ice tools and crampons, local outfitter, Hard Water Sports will rent you climbing gear for a modest price. Rent Climbing Gear Rent everything needed for the adventure; climbing boots, crampons, ice tools, helmets and harnesses. Hard Water Sports can also provide you with an experienced guide to put the ropes up and give you climbing instruction. Contact local outfitter, Hard Water Sports, for your next adventure.